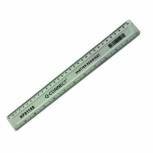 Q-Connect Ruler Shatterproof 300mm Clear KF01108 Pack of 1 300mm ruler for measuring and drawing straight lines. Featuring inches on one edge and mm/cm on the other. Quality clear plastic construction. Allows you to measure with a certain level of precision. Perfect for technical drawing. Shatter proof. 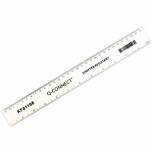 Q-Connect Ruler Shatterproof 300mm White KF01109 Pack of 1 300mm white ruler. Featuring inches on one edge and mm/cm on the other. Quality white plastic construction won't deteriorate. Allows you to measure with a certain level of precision. Perfect for technical drawing. Shatter proof to prevent accidents. 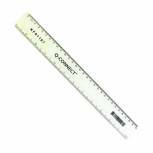 Q-Connect Acrylic Shatter Resistant Ruler 30cm Clear (Pack of 10) KF01107Q Pack of 10 300mm acrylic ruler. Featuring inches on one edge and mm/cm on the other. Quality plastic construction won't deteriorate. Colour: Clear. Pack of 10 rulers. 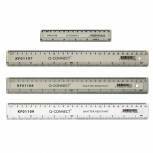 Q-Connect Clear 150mm/15cm/6inch Ruler KF01106 Pack of 1 Q-Connect Ruler. 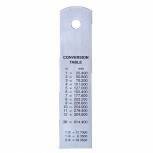 High quality clear acrylic rulers with measurements in millimetres and inches. 150mm/6. 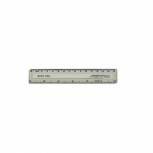 Linex Triangular Scale Ruler 1:1-500 30cm White LXH 312 Pack of 1 With six divisions, precision divided. Grooves in two colours. Supplied in plastic sheath. 1:100:200:250:300:400:500. 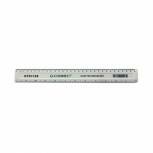 Q-Connect Shatter Resistant Ruler 30cm Clear (Pack of 10) KF01108Q Pack of 10 300mm clear ruler. Featuring inches on one edge and mm/cm on the other. Quality plastic construction won't deteriorate. Allows you to measure with a certain level of precision. Perfect for technical drawing. Shatter proof to prevent accidents. 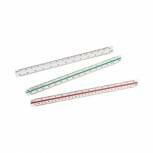 Plastic Shatter Resistant Ruler 50cm Clear 843800/1 Pack of 1 Made from translucent shatter resistant plastic. Ideal for everday use. 50cm. 20 inches. Linex Triangular Scale Ruler 1:1-2500 30cm Aluminium Black H382 Pack of 1 Linex Aluminium Tri-Scale Ruler 30cm Black H382 Colour coded inserts to aid quick scale selection. Triangular scale rules are supplied in a hard plastic storage case. Flat scale rules are supplied in blister card hanging pack. 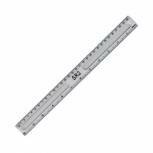 Stainless Steel Ruler 30cm/300mm 796900 Pack of 1 Made from flexible stainless steel. Suitable for precision tasks. Ideal for use with craft knives and cutting mats. 30cm. 12 inches. 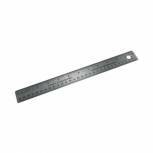 Linex Heavy Duty Ruler 30cm Stainless Steel LXESL30 Pack of 1 Linex Stainless Steel 30cm Rule featuring both metric and imperial measures with a conversion table on the reverse. Linex Triangular Scale Rule 1:1 1:20-125 30cm White 311 LXH Pack of 1 With six divisions, precision divided. Grooves in two colours. Supplied in plastic sheath. 1:1 :1:20:25:50:75:125. Linex Triangular Scale Rule 1:500-2500 30cm LXH 314 Pack of 1 With six divisions, precision divided. Grooves in two colours. Supplied in plastic sheath. 1:500:1000:1250:1500:2000:2500. 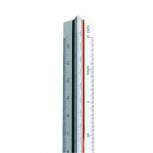 Linex Flat Scale Ruler 1:1-500 30cm White LXH 433 Pack of 1 With 4 bevels and precision divided for accuracy. Manufactured in White matt ABS material. L300mmx. W35mmxD3.0m. 1:1:5:10:20:50:100:200:500. 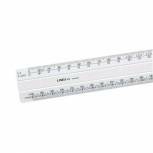 Linex Heavy Duty Ruler 100cm Stainless Steel LXESL100 Pack of 1 Linex Stainless Steel 100cm Rule featuring both metric and imperial measures with a conversion table on the reverse. 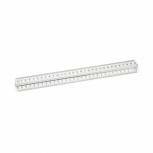 Clear Ruler 30cm (Pack of 20) 801697 Pack of 20 Transparent desktop ruler. Durable acrylic construction. Bevelled edge for easier drawing. Millimetre and inch scales. Length: 300 mm. Pack of 20 rulers. 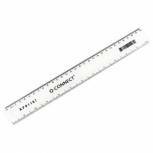 Q-Connect Shatter Resistant Ruler 30cm White (Pack of 10) KF01109Q Pack of 10 300mm white ruler. Featuring inches on one edge and mm/cm on the other. Quality white plastic construction won't deteriorate. Allows you to measure with a certain level of precision. Perfect for technical drawing. Shatter proof to prevent accidents. 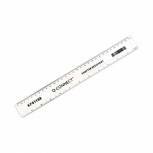 Q-Connect Acrylic Shatter Resistant Ruler 15cm Clear (Pack of 10) KF01106Q Pack of 10 Transparent desktop ruler. Sturdy acrylic construction. Bevelled edge provides greater accuracy. Millimetre and inch scales. Length: 150 mm (6 inches). Pack of 10 rulers. 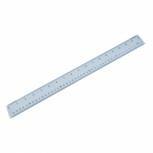 Classmaster Shatter Resistant Ruler 30cm Clear (Pack of 100) SPR30100 Pack of 1 30cm Shatter Resistant Ruler Clear. Metric on one side and imperial on the other. Bevelled edges. 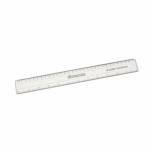 Classmaster Finger Grip Ruler Clear (Pack of 10) FGR10 Pack of 1 Easy to grip due to the raised centrepiece. Millimetres one side, centimetres the other. Clear plastic.